High Density, Multi-User (up to 4 Users), Matrix KVM Switches Controlling up to 32 USB/VGA PC, Sun, and Mac Computers with Optional USB 2.0 Peripheral Support and Optional 300-feet Remote User over CATx. 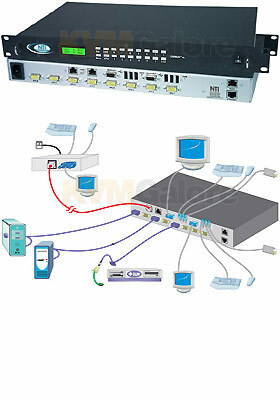 UNIMUX™ High Density VGA USB KVM Matrix Switches allows up to four (4) users to individually command or simultaneously share up to 32 USB computers. UNIMUX HD feature optional support for a USB 2.0 (low/full speed) devices, in addition to keyboards and mice, such as USB touch screen monitors, interactive whiteboards, or CAC card readers. UNIMUX HD also feature optional extender ports for locating remote users up to 300 feet via CAT-5/5e/6 cable.